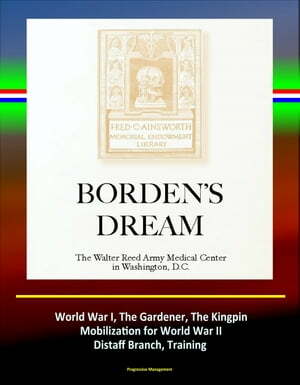 Collins Booksellers - Borden's Dream: The Walter Reed Army Medical Center in Washington, D.C. - World War I, The Gardener, The Kingpin, Mobilization for World War II, Distaff Branch, Training by Progressive Management, 9781310154928. Buy this book online. Professionally converted for accurate flowing-text e-book format reproduction, this unique book provides a comprehensive history of the Walter Reed Army Medical Center (WRAMC) of the U.S. Army medical department, with a record of the first 40 years of this important institution. The little-known manuscript, called "Borden&apos;s Dream" after the surgeon whose concept it was to build this institution, started out as a collection of newspaper clippings and historical photographs by the hospital&apos;s first librarian, Mary E Schick. Intending to the use the collection as the basis for an institutional history, Schick continued to file materials but never found time to tackle the writing for the project. Instead, in 1943 she urged a younger member of the staff, Mary Standlee, to write the story as an informal narrative history. The story was finished in 1951, but Schick died shortly before the first draft was typed and never saw the finished product. It was deposited in the post library as a permanent documentary record. Except for a copy donated to the author&apos;s alma mater, the University of Texas at Austin, and a few photocopied volumes distributed to military medical libraries, the book has never been made available to the public. It is known only to a few researchers as a source of historical information about WRAMC.